Think pink at your next breast cancer awareness walk! This bold breast cancer awareness t-shirt will really make a statement to your friends and loved ones. Show support for your friend or family member currently battling this disease. This Breast Cancer Awareness Design is printed on our 100% cotton t-shirt, machine washable in youth sizes XS-L and adult sizes S-3XL. Be sure to choose your favorite "Walking for Breast Cancer Awareness" text color to be printed on the front of the shirt. Additional Info Your breast cancer walk team will look great at your event when they wear one of our breast cancer awareness apparel items. 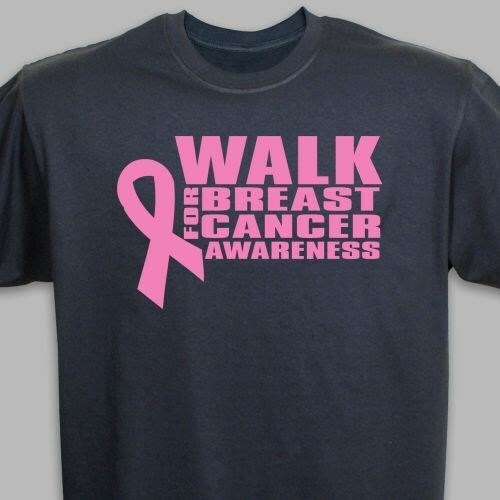 This Walk for Breast Cancer T-Shirt is direct, to the point, and will definitely stand out. A portion of your purchase will go to the breast cancer charity of your choice.